The Ridge at Castle Pines, a Troon® course south of Denver, offers visitors a high-end golfing experience that’s unique to Colorado’s Front Range. The 212-acre, Audubon-certified sanctuary course sits at an elevation of 6,500 feet with vistas and wildlife that few other courses in the area can match. Unlike neighboring courses, The Ridge is a daily-fee facility that’s open to the public. 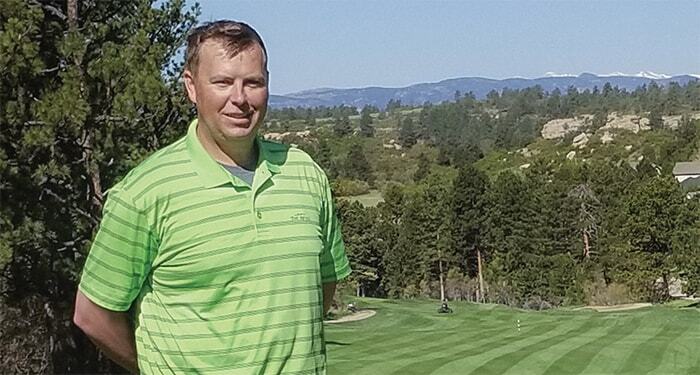 Although Hedberg and his team must operate within the constraints of a relatively small budget, they work hard to provide the best possible course conditions. As busy as they are, Hedberg and his staff put a strong emphasis on environmental responsibility. They’ve decreased The Ridge’s irrigated acres over the past few seasons by turning seven acres into native grass. On the 80 acres that are irrigated, they use reclaimed water provided by a facility in nearby Castle Rock, CO. They also repurpose any trees that need to be cut down or trimmed, creating benches and mulch that can be used throughout the course. That same sustainable focus extends to the fertilizer that Hedberg’s team applies to the course except its greens – UMAXX stabilized nitrogen fertilizer from Koch Turf & Ornamental. A urea-based product with a 46-0-0 analysis and dual inhibitor technology, UMAXX protects against all three forms of nitrogen loss: leaching, denitrification and volatilization. It’s a completely soluble granular product that’s equally effective whether it’s sprayed or spread. Hedberg and his crew apply UMAXX as a granular, walk-spreading the fertilizer around tees, green surrounds, bunkers and bunker fingers. Then, they apply it to larger areas of the course with a tractor and tow-behind spreader. It’s a time-consuming process, which makes the fact that they can apply UMAXX just a few times a year even more beneficial. Perhaps even more importantly, The Ridge’s turf looks better than ever. A few years ago, one of Troon’s agronomists tested the course’s soil and asked Hedberg what he was applying to the turf. “I told them ‘Just UMAXX,’” he said. “Simply putting down the nitrogen we need when we need it has produced great results for us. We don’t have to deplete our already limited budget by purchasing a lot of other products. The agronomist was blown away when he heard what our course budget was and saw how great our course looked.